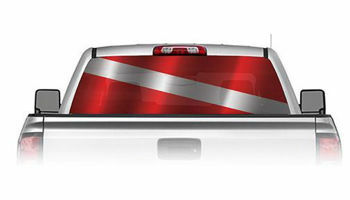 Dive Flag see through window graphic from Weston Ink will make your truck look awesome and others will envy you. Easy to install because of it's design and material. The tiny holes that give it the view through property make it virtually impossible to get an air bubble with this decal during installation. This graphic will make your truck look great and still allow you to use your back window view without blocking it. Make your vehicle known as that cool truck people see cruizing around town. We design our graphics ourselves and take pride in the fact they can only be found here at Weston Ink. If you have a picture you would like turned into a rear window graphic just email us and we can get you a quote. We also do custom business logos for your work truck. The back of the window makes great advertising when driving down the road. We have many designs to choose from in many sizes to fit your truck. If you are unsure of the size you need just give us a call or email and we can help you out.